Gini Wijnaldum scored a fantastic goal and put in a pretty special performance against Bournemouth on Saturday. The Dutchman’s lobbed finish was sublime, but his overall contribution just as impressive; more so considering the fact he could barely play because of illness. So bad was Wijnaldum feeling, that he was throwing up and suffering from diarrhoea on Friday night. In fact, the midfielder has admitted to almost having an accident on the pitch – as Gary Lineker famously did all those years ago! “Thursday night I had a tablet from the doctor for my knee,” said Wijnaldum, reported in the Echo. “It was a tablet that could induce stomach pains. “The manager called me and said ‘do you think you can play?’. I said I was as positive as I can. “In the morning I was still weak and had diarrhoea I must say the tablets helped a lot. 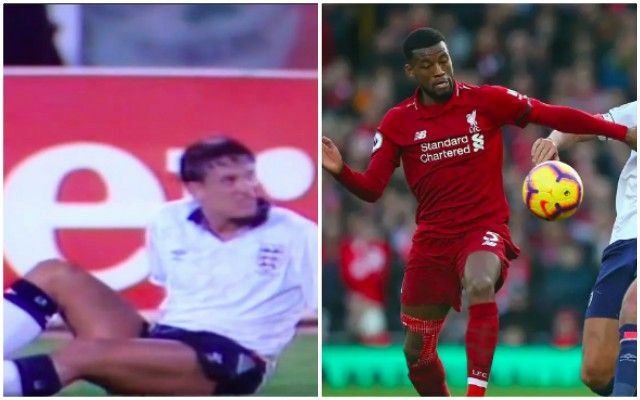 We’re very glad that the viral clip doing the rounds from the weekend is Wijnaldum’s goal, and not anything less pleasing on the eye! Right now, Gini is probably our best a most important midfielder. Fabinho is running him close, but the manner in which the 28-year-old knits together our play and finds pockets of space makes him invaluable. Going forward, we’d like to see the trio of Wijnaldum, Fabinho and Naby Keita much more. But Jurgen Klopp likes Jordan Henderson and James Milner in big games, and with tests against Bayern Munich and Manchester United coming up, it’ll be interesting to see who he goes for.